Early in the year we did a root cause analysis that determined that the initial drop in oil prices was caused by manipulation of interest rates resulting in malinvestment and overproduction. As we drilled down we found the root cause to be the debt based monetary system itself. Full post here. Since that time oil prices have languished, taken another leg down, and again it appears to have some roots in our debt based monetary system, but for surprisingly different reasons. There is a second flaw in societies that is also causing related havoc in the oil market, socialism. We will start our focus again on the debt based monetary system. 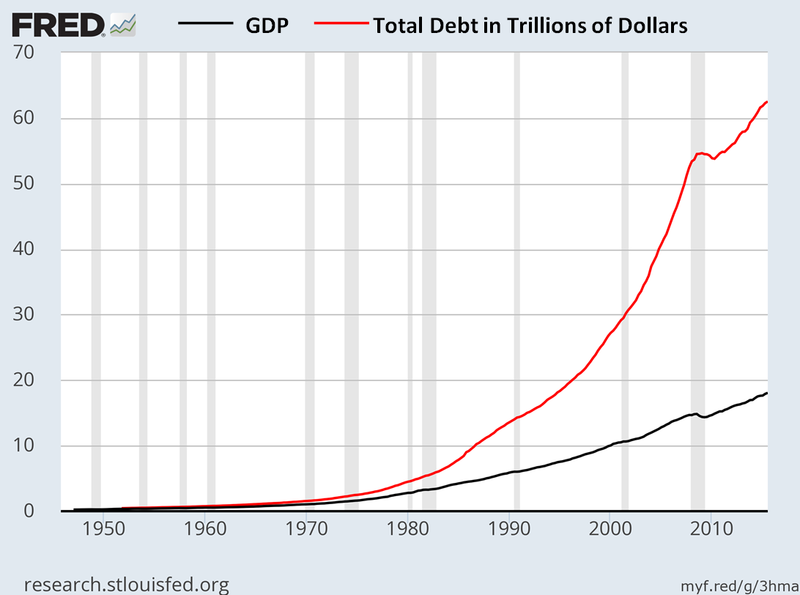 As has been shown before, a debt based monetary system must create more debt exponentially each year, or it will collapse. Money and the economy will grow as well, but at a much slower rate. It is simply a feature of the system, and eventually, the economy can no longer service the debt. Below is a chart of total credit market debt (one of my favorite charts but conveniently discontinued by the Fed), to GDP, which can be thought of as national income. Though total credit market debt is continually rising, there are sectors that will jump ahead of the general trend. 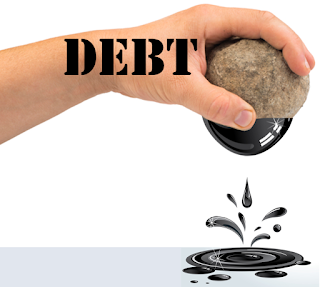 Like the real-estate sector before it, a spike in debt most recently occurred in the energy sector, specifically the shale oil (fracking) plays. As small oil companies borrowed huge sums of money, they did what drillers do, poked holes in the ground, and not surprisingly it resulted in more production. That flood of oil caused prices to drop, as would be expected, but then something interesting happened. The oil companies began to pump oil even faster. This led many to look on in amazement, but the reason quickly became clear, DEBT. An overload of debt in the oil patch has temporarily distorted the economic law of supply and demand, and price discovery. 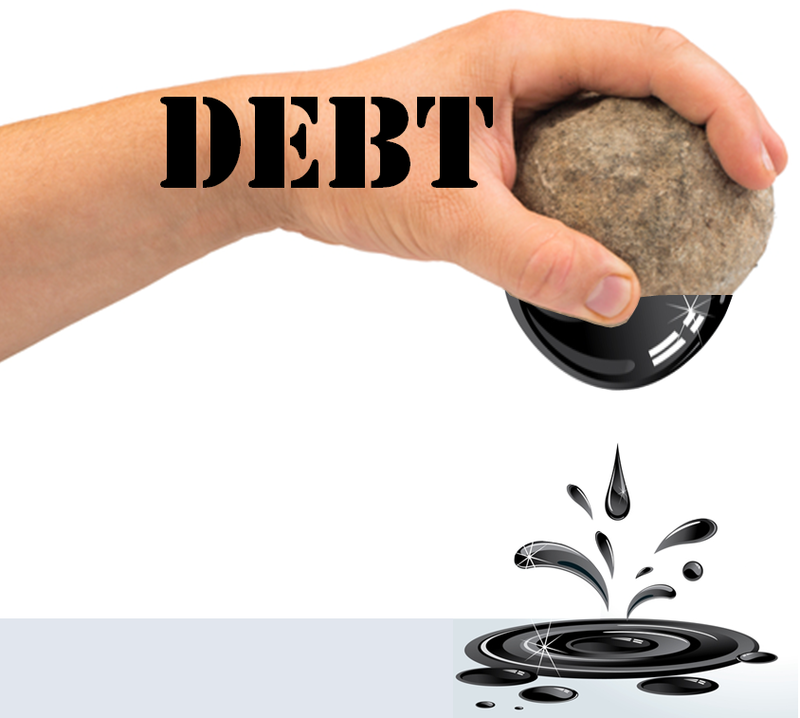 Being held to fixed debt payments as the price of the underlying asset falls, there is only one thing that an oil company can do considering they can only raise revenue one way, and that's pump and sell more oil. Where as an oil company with no, or a reasonable debt load, could quietly and somewhat painlessly take production off line until prices realigned with cost, an over-indebted company has no choice but to increase production in an attempt to survive. If only a small portion of companies had their hand forced by debt, there wouldn't be much of a problem, but when it is the entire industry the supply demand fundamentals are temporally shredded. I say temporally because under this dynamic the oil companies will eventually fail, and the assets/oil wells will land in less leveraged hands who can hold off production. Supply and demand will realign at a level commensurate with total cost production, but currently the proper forces of the free market are being delayed. Of course this process of defaults and deleveraging in an industry as large as energy will have larger implications that could cause a critical mass default, but that is for future post. Now on to socialism, which surprisingly causes a similar dynamic as explained above. If we don't just think of debt as money borrowed, but any deduction from revenue unrelated to current operating costs to produce oil we can also include government taxes on a country's oil industry. If a country has the ability to control the oil industries production, and they have built their social system around oil revenue, they are in the same situation as the debt laden shale drillers. The difference being, if an over indebted shale driller s goes bankrupt the executives lose their jobs and stock options, if an oil exporter can't maintain its social welfare programs that their people have become accustomed to, they risk major civil unrest and revolt. Venezuela, Saudi Arabia and many other OPEC nations are in this situation and in many cases have attempted to increase production to make up for the shortfall left by receding prices. Even Russia has some of these dynamics at play, as this quote illustrates. While this situation is causing a larger glut of oil now, it is also causing a lack of investment in future production, which could cause a just as impressive snap-back when restructuring occurs for both companies and nations, but only time will tell. The reality is, debt based monetary systems cause excessive amounts of debt, and excessive debt prevent market participants from rationally reacting to supply demand fundamentals and hinders the price discovery mechanisms of the free market. Socialism appears to do the same for oil exporting nations. I ordered a replica gucci bag here. When I received the bag, it surprised me a lot.replica gucci handbags This bag is perfect and the quality is exactly the same.FAKE HIGH QUALITY GUCCI MENS PORTFOLIOS A dazzling masonry. I introduced this website to my friends, and my friends liked it very much.